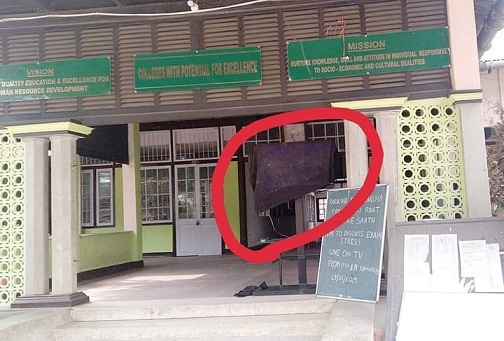 Students of JB College (Autonomous) at Jorhat with the support of AASU members of the college on Tuesday placed a black cloth cover on the TV screen of the college to stop viewing of Prime Minister Narendra Modi‘s special programme for students telecast on the day. The students were protesting against the Ghograpar incident in Nalbari where members of All Assam Students’ Union (AASU) were attacked and the AASU flag was desecrated during a scuffle which had ensued on Sunday allegedly by BJP supporters. Activists of the students’ union under the leadership of AASU state organising secretary Jul Khound blocked the National Highway-37 at Jorhat’s western bypass end for an hour from 12 at noon to 1 pm to protest against the Nalbari incident. The activists, carrying posters and banners shouted slogans against Assam chief minister Sarbananda Sonowal, BJP Assam unit president Ranjeet Kumar Dass and against the Citizenship Bill, 2016. Along with other parts of Assam, all Barpeta district students’ union of the AASU also blocked the arterial National Highway No 31 at Pathsala traffic point under Barpeta district of Assam in protest against the alleged assault on its members by Bharatiya Janata Party (BJP) workers at Nalbari on January 27 last. They shouted slogans against the BJP government on the NH 31 and demanded immediate arrest of the BJP workers who attacked members of the students’ union at Nalbari. The AASU members on January 27 waved black flags at Assam chief minister Sarbananda Sonowal, finance minister Himanta Biswa Sarma and transport minister Chandra Mohan Patowary at Ghograpar in Nalbari district of Assam while protesting against the much-debated Citizenship (Amendment) Bill, 2016.